I am proud to say that I was a member of the Central Province Provincial Council in 1993 when we were asked, as a province, to dedicate and preserve sections of the Novitiate property at Godfrey, IL, as a nature preserve. Whenever I tell people about that, they immediately ask me whether I voted for or against the proposal! I am also happy to say that I remember that the decision of the council was unanimous to devote a large parcel of our Novitiate as a protected nature preserve, particularly some very valuable land along the Mississippi River bluffs. This was the beginning of what later developed into the Oblate Ecological Initiative at the Immaculate Heart of Mary Novitiate which began in 2001. 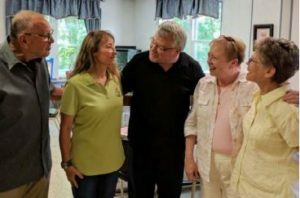 This initiative began under the leadership of former Oblate, Maurice Lange, along with the community – supported garden and the Ecological Learning Center. He was soon joined by Sr. Maxine Pohlman, SSND, who has continued as Director of the Center these many years since. The garden is now independent and this is a real sign of its progress and success. Some of these farmers at the Novitiate have begun other similar agricultural projects which furthers the work begun here. This office of “Justice and Peace and Integrity of Creation” (JPIC) owes a great debt of gratitude most especially to Séamus Finn, OMI, who successfully guided and promoted its mission over two decades as its Director and Mentor. 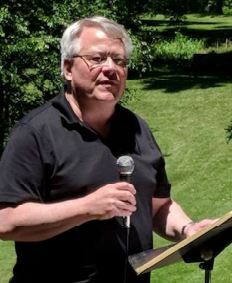 Special thanks as well to the ministry of Antonio Ponce, OMI, as Director more recently, and to Oblates Norm Comtois, Darrell Rupiper and several other Oblates and friends who served on the JPIC Committee over these many years. Special thanks as well to Mr. George Ngolwe and Ms. Mary O’Herron, for their dedication and vibrant spirit of service, at our Washington office. The Ecological Initiative has also been supported by many retreats at the Lebh Shomea Contemplative and Retreat Center in Sarita, Texas, on the theme of “Integrity of Creation” as well as the support by the Missionary Oblates of the Three Part Harmony Farm on the property of the U.S. Province in Washington, D.C. Yes, a community supported garden in the center of the city in Washington, D.C. at our Oblate headquarters! We preach the message of Jesus who often used parables and examples relating to soil and food and weather. Our faith teaches us that all of creation was made in and through Jesus Christ (St. Paul) and in the book of Genesis, after God had finished the work of creation, He saw that it was good. Each year, the Oblate novices have the opportunity to have their spirituality shaped, in part, by the beauty of this Novitiate property and to encounter God’s grace and generosity on this “holy ground.” More than 20 years before the Encyclical of Pope Francis, “Laudato Si,” this ministry of preserving a forest area and the development of shared farming by the Missionary Oblates was a forerunner of Catholic Ecological Awareness. It is our sincere hope that the Oblate stewardship of this land, with all of its ability to teach us about God’s generosity and goodness to us, will continue for many years into the future. On behalf of the Missionary Oblates of Mary Immaculate, I offer our sincere thanks and congratulations to all who have supported this effort these past 25 years and to all who will continue to support it for many years into the future.